Developing a great product or service first involves a series of steps. A different set of steps is required to make that product or service great in the minds of its market. Picture the child who walks in front of a first grade classroom with a coat of arms for show and tell. Telling your company’s story to an audience in an advertising or marketing environment is much like this. Most people, Moms excluded, won’t give you the time of day. They’ve conditioned themselves to ignore the thousands of messages constantly asking for attention. Successfully engaging and leaving this audience with a message is a challenge. To breakthrough and tell your story, two simple things must happen. You must capture your audience’s attention then draw them in to the point of connection. The first part, capturing their attention, is easy – For example, the child with the picture of the coat of arms – a logo of sorts – a symbol of pride. Standing in front of the classroom, the child captures the audience’s attention using the coat of arms, then reels the audience in by telling a story about Arthur and the Round Table, or of a family’s journey to America, or how a family business became a reality. Maybe the story is about how the child’s group of friends created a tree house club. 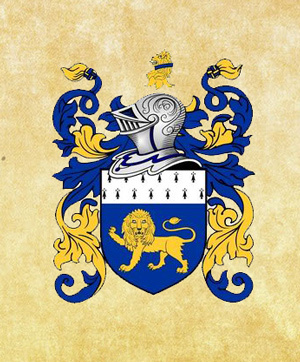 Should the child appear the following week with the same coat of arms but another good story, one that reinforces the first, the classroom begins to look forward to hearing more, and they begin to form a bond with the coat of arms. One secret to the child’s success in holding the audience’s attention – the story always contains a challenge. Maybe it’s a journey, a competition, a quest, or discovery. To tell great stories we often answer the challenge of connecting with the challenge that weaves the story together. By incorporating the right challenge with other story elements, we build a brand. After all, your Mom can’t afford to buy everything in the store.